Northern Ireland manager Michael O'Neill has called on his side to be "a little bit more polished" in the final third after their 2-0 win over Estonia. Two second-half goals secured victory for Northern Ireland in their opening Euro 2020 qualifier after Paddy McNair missed a gilt-edged chance to put his side ahead in the first half. "Subconsciously you think something might go the other way," said O'Neill. "But we know as a team that we need to improve at times in the final third." He added: "It is difficult when you have chances and you don't take them." 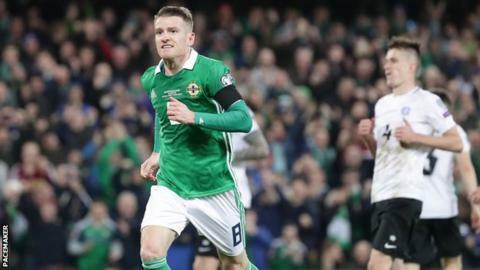 Northern Ireland were rarely threatened in the first half in Belfast but they struggled to create clear-cut opportunities themselves despite playing mostly in Estonia's half. McNair's downward header from just a couple of yards out bounced over the bar as the sides went into the interval level at 0-0. "Our final ball at times needs to be improved and we didn't get enough contact on the ball in the box," said O'Neill, whose side's attacking play improved in the second period. "A lot of our play was very good but we just need to be a little bit more polished in the final third." There was a palpable sense of relief around Windsor Park when Niall McGinn broke the deadlock in the 56th minute before a Steven Davis penalty gave the hosts some breathing space. "Once you get the opening goal it takes the tension out of the game and the team starts to relax a little bit," O'Neill added. Estonia's biggest opportunity came with the score at 1-0 when Henri Anier raced through on goal only to be denied by goalkeeper Bailey Peacock-Farrell. The 21-year-old keeper started the season as Leeds United's first choice but has since fallen behind Kiko Casilla in the pecking order at Elland Road. "He is a very young goalkeeper and we are asking a lot of him," O'Neill said. "He has got huge potential and in a key moment in the game he made a big save. He will grow from that and a clean sheet is important for both the team and for him." Northern Ireland host Belarus on Sunday and will hope for another three points, with games against Group C favourites the Netherlands and Germany to come later this year.